Here's where the Peacock ended up. Why am I telling you this? Because that's what I did with a couple of my old dupattas. 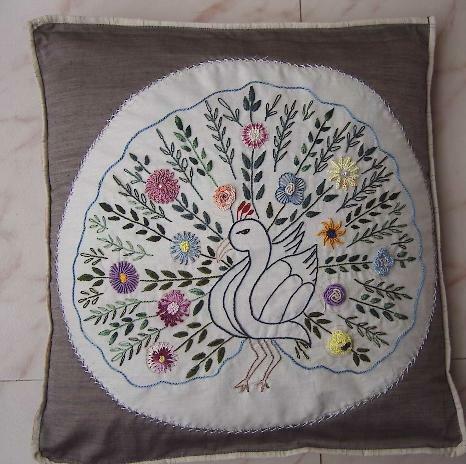 I got them converted into cushion covers and then I appliqued the peacock on it with herringbone stitch. Here it is. A quick and easy applique. I used Anchor metallic thread for the herringbone.Thankfully for once, the thread did not give much trouble.And the gentleman does look royal over there . That's all for today. Wish me luck my friends, tomorrow I teach all that you see on the cushion to a bunch of eager ladies from different parts of Bangalore. Thats a good job with Odnis.Wonder where all my odnis are!But NO,you take the credit for patience.All the best for the classes. This looks really good. And such a great thrift project as well!! I like the new look of your blog btw! 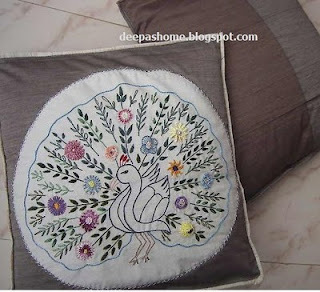 Deepa, what a great idea for your peacock, it looks lovely on the cushion.... good luck tomorrow, have fun! Hugs. Deepa, It is so cute. nice work deepa, have u got a sewing machine? Emh..u too..i think all indian women have this idea of converting old uniform/duppatta to pillow cover and you have thought little different to end up with cushion cover..emh..not a bad idea...your cushion looks gorgeous. 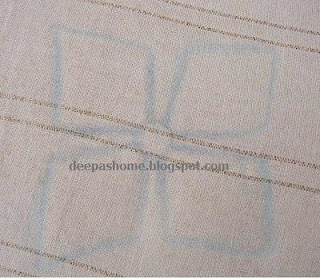 Post step by step process to convert a duppatta to cushion cover. I would love to know. I've hell lot of duppatta lying around. I can try my hand on that too. The piping around the cushion is perfect. stopping here. Very good work. Keep publishing posts! Beautiful fabric. Thanks for your creativity in design and color. 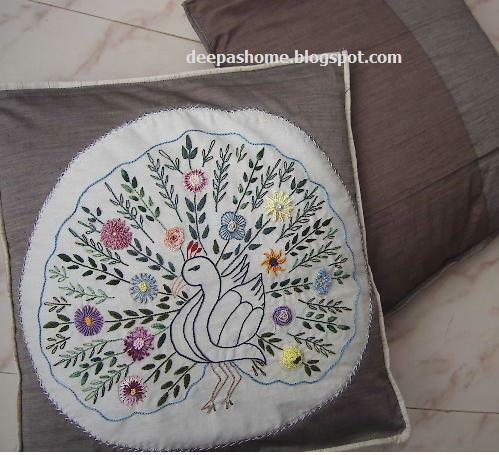 Love the flower that you have put on pillows.